20% of sales to the fundraiser with the flyer. 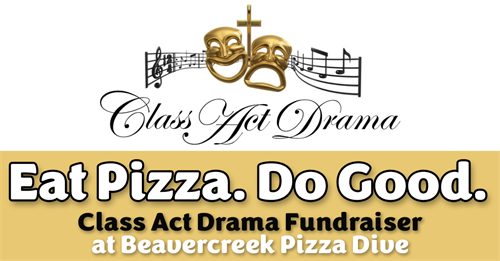 Class Act Drama Fundraiser April 8 - 11 at Beavercreek Pizza Dive. Class Act Drama is a Christian, nonprofit, theatrical organization. Their goal is to provide live theater experience to those in the homeschool community--specifically geared toward students seventh grade through twelfth. Click here to find out more. Show your support for Class Act Drama and help them raise some dough when you eat pizza April 8 - 11 at Beavercreek Pizza Dive. Come to the Fundraiser Kick-Off at the All-You-Can-Eat Buffet on Monday, April 8 from 4:30 to 8:00. Class Act Drama volunteers will be your celebrity servers at the Fundraiser Kick-Off. $1 from every Adult Buffet purchase goes to the fundraiser when you bring the flyer (link below). Eat pizza Tuesday, April 9 - Thursday, April 11 and 20% of your purchase goes to the fundraiser when you bring the flyer (link below). Come out, come hungry, come eat some pizza, and come raise some dough for Class Act Drama.